Area: 51 sq km. Location: Southeast of Squamish at the head of Shannon and Britannia creeks. Terrain: This area a few kilometers southeast of Squamish offers everything from stiff scrambles to technical multi pitch alpine climbing. Some of the rock is good, but some is poor and loose. Map 92 G/11 offers a very poor depiction of the area. 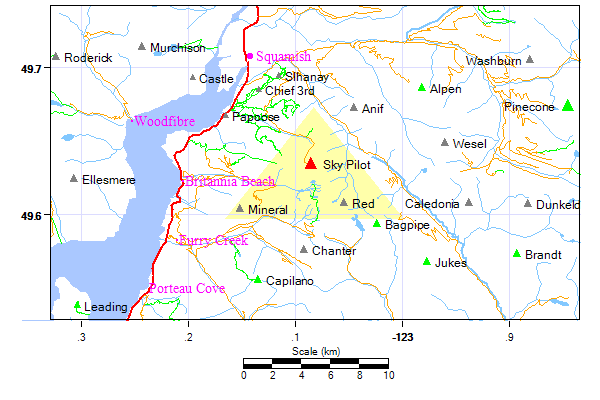 It is best to seek out the BCGS 1:20000 TRIM Map (92G.065) for this area, which is available for photocopying at the UBC Map Library History: Prospectors were the first to explore the Sky Pilot Group. The nearby Britannia copper mine, and Mount Sheer townsite, in operation from the turn of the last century to the 1970's, provided an incentive for the prospectors, and a base for climbing exploration. Basil Darling climbed Sky Pilot in 1910; Don Munday summited Habrich and Ledge; some of the earliest technical climbs in the Coast Mountains were made on the humble north face of Mt. Sheer in 1963 (a whole year before the famous National Pillar of Winstone). In 1975, Karl Boerner and Robert Paul completed the first traverse of the main Sky Pilot group, from east (Nai) to west (Co Pilot).